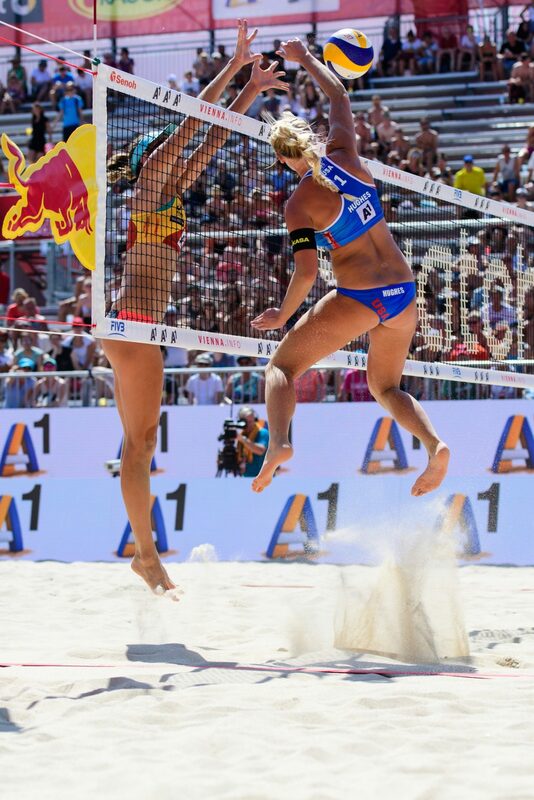 KT Tape®, category leader in kinesiology taping products, announced today the signing of beach volleyball player Sara Hughes as an athlete ambassador. A six-time beach volleyball collegiate national champion, Hughes was recently named the 2017 FIVB Beach Volleyball Rookie of the Year. She also was part of the youngest team to win an AVP Pro Beach Tour tournament with a victory in the AVP’s 2017 season-ending championship. Hughes joins the KT Tape team through 2020, and she has her sights set on competing in the Tokyo 2020 Olympic Games. She began her full-time professional career in May after graduating from the University of Southern California where she captured six national titles, which featured a streak of 103 consecutive wins. She played on both the FIVB World Tour and AVP Tour this past season. In addition to the win in the AVP season finale, Hughes also finished among the top 10 in each of her AVP appearances in 2017, including third at the Manhattan Beach Open. On the FIVB international circuit, she finished as one of the top 16 women’s teams by winning 18 of 31 matches at seven events. Hughes becomes the 15th athlete, and second beach volleyball player along with five-time Olympian Kerri Walsh Jennings, in KT Tape’s current ambassador lineup of the top Olympic and Paralympic sport athletes. KT Tape’s commitment to the Olympic and Paralympic movements also includes supporting the U.S. Olympic Committee and relationships with eight National Governing Bodies. Visit KTTape.com to learn more about each athlete ambassador and their journey. KT Tape is a lightweight, elastic sports and fitness tape designed for muscle, ligament and tendon pain relief and support for many sports-related injuries. Applied along soft tissue, KT Tape interacts naturally with the body’s neuromuscular systems to allow individuals to remain active while recovering from injuries. It is the only solution that provides pain relief and support before, during, and after activity without restricting motion. KT Tape is designed to withstand sweat, strain and can be worn in water or under body-hugging athletic apparel while providing long-lasting relief. KT Health (dba KT Tape), based in American Fork, Utah, is the category leader in kinesiology taping products, providing pain relief solutions and support for many common sports-related injuries. Used by professional athletes,Olympians and Paralympians, and everyday athletes, KT Tape products have been adopted in nearly every sport. Following the Beijing 2008 Olympic Games, KT Tape experienced accelerated growth as its products became widely available in retail channels. Currently, KT Tape products are sold in over 35,000 retail locations in the U.S. and 40 countries worldwide. KT Tape’s broad distribution covers sporting goods, food, drug and mass retail channels, as well as clinicians, online retailers and the company’s own e-commerce site, KTTape.com. KT Tape empowers consumers with a wealth of educational resources, including a vast library of online videos and on-site demonstrations at more than 150 athletic events each year. With new innovations and an expanding product line, KT Tape continues to strengthen its global presence. For more information, visit KTTape.com.